So, you can see the box has Singapore as theme and decorated well in flavours of Singapore. The products in the box are included keeping in mind the cosmopolitan nature of the country. 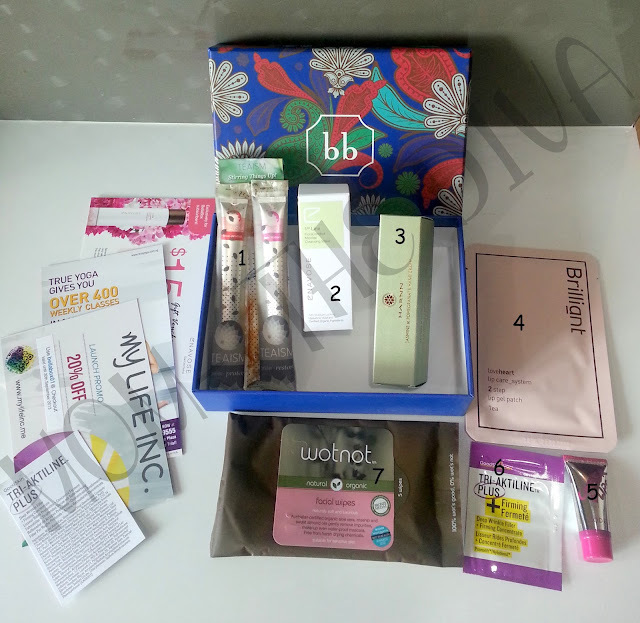 Products from different parts of the world which are suitable for Singapore's weather are a part of this box. Quite Interesting isn't it? 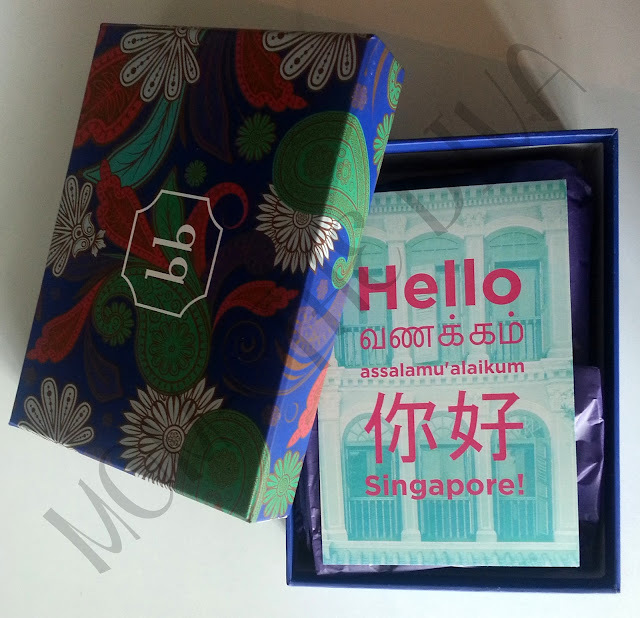 Hats off to Bellabox team for making the box so interesting and meaningful for celebrating Singapore's Birthday! There were total seven products with some vouchers. The range of products included skin care, make up, drinks etc. 1. my LIFE INC. TEAISM Tea Brew, 2g Wands X 2 (Retail Price- S$1.50 per wand): These are healthy teas for those on the go, targeting the inner wellness. 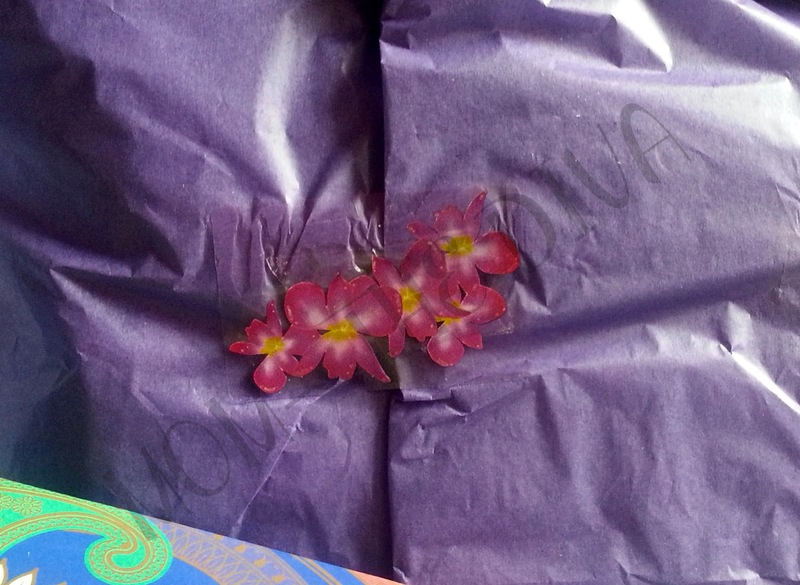 They come in disposable wands containing high-grade loose tea leaves. The various variations are available-Ginger Black Tea (for comfort), Green Tea (for balance), Fancy Black Tea (for energy), Blueberry Tea (for protection) and Osmanthus Oolong Tea (for restoration). These are easy to brew as well- just empty in a cup of hot water and stir. I got the ones for protection and restoration. 2. ENAVOSE Floral Comfort Micellar Cleansing Water, 30ml (Retail Price- S$45 for 120ml)- As cleansing is the first and foremost step towards healthy skin, Enavose Cleanser is gentle and no-rinse cleanser. This purifies skin while retaining the natural protective layer of the skin. This is also suitable for sensitive skin and also works as make up remover. This is also great for on the go as you need not rinse it off. On application, the cleanser did leave the skin well hydrated and smelling fresh and clean. 4. Brilliant 2-step Gel Patch, 1 packet (Retail Price- S$19.90 for a pack of 5)- This is something new for me... never heard of lip pack. It is for getting moisturized and chap free lips. It has grape seed extract with antioxidant power and honey to prevent ageing. 5. ModelCo Cheek and Lip Tint (Rosy Red), 5ml (Retail Price- S$28 for 10ml)- This is perfect for that perfect rosy look without showing off the make up. Can be used on lips and cheeks with fingers and can fit easily into the bag for on-the-go application. The colour is actually very natural and gives a nice, subtle glow. 6. Good Skin Lab Tri-Aktiline Plus Instant Deep Wrinkle Filler, 1ml (Retail Price- S$66 for 20ml)- This is an instant wrinkle filler for a youthful appearance. Since I don't have wrinkles as of now... so it was not possible to test this out. 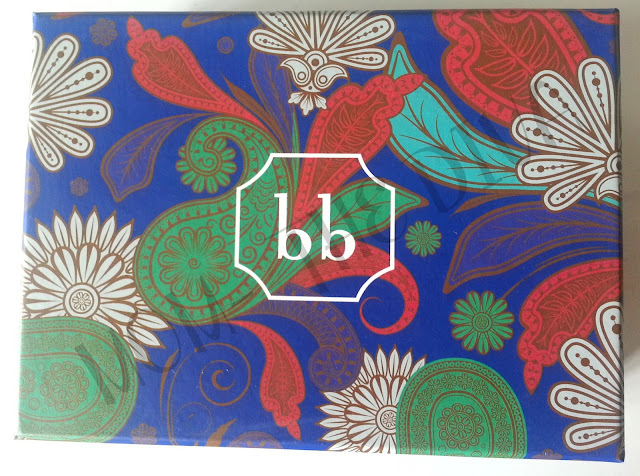 But others may like to try it out and you can find it at BellaBox online store here. 7. Wotnot Facial Wipes, 5 wipes (Retail Price- S$9.25 for 25 wipes)- With Singapore's humid weather, these wipes will help you feel refreshed all day long. These contain all natural ingredients like aloe, rosehip oil and Vitamin E and is suitable for sensitive skin. The wipes are of fairly big size and feel really good. The best part is it does not leave your skin feeling extremely dry as is the case with most facial wipes. Along with these products, there were vouchers from My Life Inc, Enavose and true Yoga. From the products, I loved the HARNN Hand Cream and Wotnot Facial Wipes. Brilliant 2-step Gel Patch id definitely worth a try. Will let you all know when I try it out.